The East Academic Building at Webster University is a 94,323 sq. ft. structure that hosts Webster’s Business, Math and Technology schools. This Building contains 41 classrooms, 59 offices, and 4 conference rooms. It consists of 3 stories of classrooms that are connected by 3 corridors and 2 large common areas, and a 3rd floor that hosts all of the faculty and staff offices. The East Academic Building is a LEED Gold building and has green features such as, green roofs, sunshades and rain gardens. The construction cost for this project totaled approximately 29 million dollars. 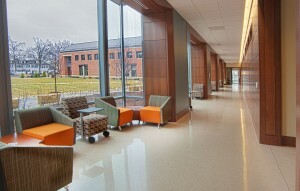 PARIC’s East Academic Building for Webster University has received LEED Gold Certification.